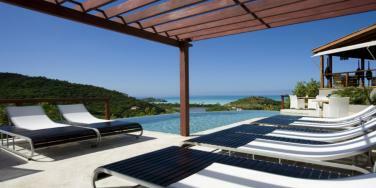 Antigua is an excellent holiday destination with plenty to occupy visitors of all ages. Many of the 365 beaches are protected by reefs, ensuring that the water lapping the white stretch of sand is calm and suitable for swimming. There is a vast selection of watersports on offer while back on dry land there are two 18-hole championship golf courses. Possible excursions including swimming with stingrays, ziplining through the rainforest and boat trips to Barbuda - see below for some popular activities. - Take part in watersports including windsurfing, kitesurfing, kayaking and scuba diving. Most resorts offer a range of water based activities, with consistent winds making the waters around Antigua perfect for sailing. 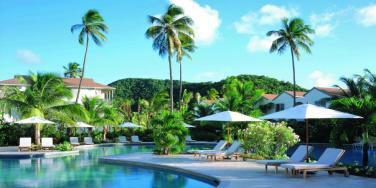 - Go on a snorkelling excursion. The most popular snorkelling spot in Antigua is Cades Reef in Cades Bay Marine Park, or you can take a boat trip to Green Island for great underwater viewing. - Discover Antigua’s history on a Jeep safari, where you visit many of the island’s top tourist attractions with a local guide, travelling off-road at times so you can enjoy the very best views. 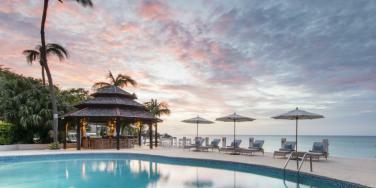 Some safaris include kayaking through mangroves, visiting small islands just offshore and snorkelling over coral reefs. - Go on an excursion to Stingray City, where after a short boat ride families can pet stingrays, swim with tropical fish and snorkel over a colourful coral reef. The sandy seabed and shallow, calm and clear waters make this the perfect day out for all ages. - Embark on a journey over the rainforest on a canopy zip line tour, taking in the unforgettable views from above the trees. An ideal activity for families with teenage children, there is a choice of four tour which each includes a series of zip lines, suspension bridges and aerial walkways. - Take a helicopter tour over Montserrat, a small and beautiful volcanic island that is nicknamed “The Emerald Isle of the Caribbean”. -Head to Heritage Quay or Redcliffe Quay for duty-free shopping where the cruise liners dock. If you are looking for more of a Caribbean shopping experience visit the St John’s Saturday Markets where local vendors come to sell a variety of goods from crafts and spices through to fresh produce, in particular we recommend trying the Antiguan Black Pineapple! - Take a day trip to the neighbouring island of Barbuda, a small and picturesque island which is bordered by deserted pink sand beaches. The undeveloped island is a natural habitat for Frigate birds - the Frigate Bird Sanctuary is found in the north western corner of the island beside a lagoon which occupies almost the entire western side. It is possible to reach Barbuda by ferry from St John's in approximately 90 minutes while a quicker alternative is to travel by air. The Museum of Antigua & Barbuda: An ideal venue in St Johns for discovering artefacts and displays depicting the history of the island. The Museum of Marine & Living Art: Located in St Johns, containing an extensive collection of Antigua’s seashells and relics from shipwrecks. Fort James: Fort James at the northern entrance to St Johns Harbour and Fort Barrington at Goat Hill date back to the 1600s with the latter being used as a signal station until as recently as 1960. Betty James Sugar Plantation: Betty's Hope is a sugar plantation dating back to 1674. The plantation still boasts two windmill towers and there is a small museum providing information about the estate. 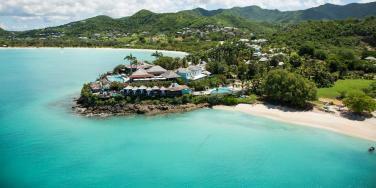 Half Moon Bay: Half Moon Bay is one of the most beautiful beaches on Antigua. Almost circular in shape with an entrance facing the Atlantic, it makes an interesting surfing spot. Numerous sporting facilities can be found here including a variety of 'have a go' games on Sundays. Falmouth Harbour: Falmouth Harbour has been a safe port for ships for centuries and the village next to it is one of the earliest settlements on the island. English Harbour & Nelson’s Dockyard: Next to Falmouth Harbour lies the renowned English Harbour and a former Naval dockyard known as Nelson's Dockyard, which is the only working Georgian naval dockyard in the world. 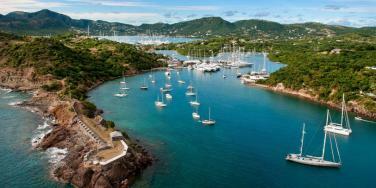 The dockyard was established in 1743 when the British chose Antigua as the main base for the Royal Navy, due to its central location and easily defended natural harbour. Here ships were based, maintained, restocked and watered. They were also 'careened' (hauled over on their sides to clean the barnacles off the bottom). Many of the Georgian buildings were constructed from the bricks and stones that were used as ballast in ships, which arrived empty and returned laden with a cargo of rum and sugar. The dockyard declined in the late 19th century due to the advent of steam ships and the closed in 1889. It subsequently fell into disrepair and was restored by the Antiguan Government in the1950s. Inside Nelson's Dockyard there is a small museum known as the Admiral's House holding a variety of artefacts and exhibits. After all this history call in to the authentic Copper and Lumber Store or Admirals Inn for a cold beer or delicious planters punch, perhaps accompanied by some conch fritters or fresh swordfish! Shirley Heights: Overlooking English Harbour is a bluff containing the ruins of Fort Shirley named after General Sir Thomas Shirley, Governor of the Leeward Islands. 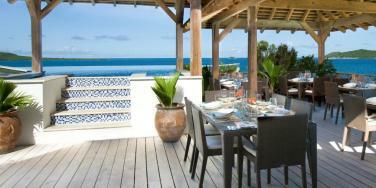 This offers a fabulous view of the harbour and is a great place to watch the sunset. On a Sunday afternoon and evening it becomes the place to be for both tourists and locals with music, BBQ food, local crafts and dancing. The cuisine of Antigua features a lot of seafood such as lobster, red snapper, conch and mahi mahi, while local specialities include saltfish and Pepperpot served with Fungee - a hearty stew served with cornmeal dumplings. Many of the island’s best restaurants are found within hotels and resorts, including East at Carlisle Bay, Sheer Rocks at Cocobay and The Cove at Blue Waters. Falmouth Harbour and English Harbour are both home to a selection of good quality restaurants, while there are street food shacks across the island that serve traditional local dishes. 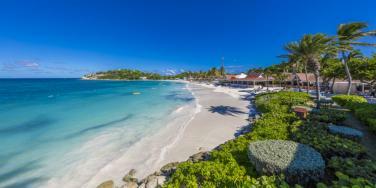 There are plenty of lively bars in Antigua where local bands play reggae and calypso music, some occupying historic buildings with stunning views. 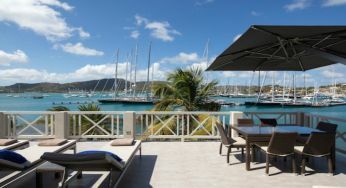 Many drinking venues cater primarily for the yachting crowd, particularly in English Harbour and Falmouth Harbour.Shirley Heights is well worth visiting on a Sunday evening - visitors can enjoy one of the infamous weekly ‘Barbecue and Lime’ parties where grilled meats and salads are served as the sun set, washed down with rum punch. There is a buzzing, typically Caribbean atmosphere with a mixture of locals and tourists being entertained by local bands.